My husband bought a pair of these, and I liked them so much that I got a pair of my own! (XS fits a woman great). Mine have held up fine, but the waistband on my husband's recently broke after a few months of washing and wearing. I'd say overall the material is thick and warm and good quality, but their integrity may be compromised over time. 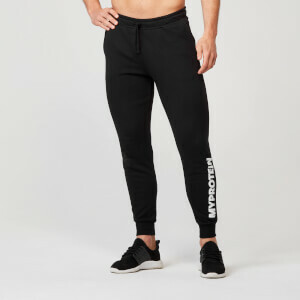 I brought these at the end of November and they fitted really nicely and were very comfortable. The ankles were a bit tight for getting on and off, but now less than 3 months later holes have started to appear around the crotch seems. Not good quality at all for the price! The whole inner fabric is coming apart... i only used a couple of times but when i take it off there are huge chunks of fabric coming off... this is ridichilous for the price. Goes well with a vacuum cleaner after you underess. Look great until they get holes everywhere. The quality of stitching and fabric is poor and although they look good after a few washes they develop holes in the crotch and pockets. Wouldn't recommend. Love these slim sweatpants. Usually wear a medium for sweatpants, but went with a large due to these being slim and reading some of the reviews and they are a perfect fit.Have since ordered 2 more pairs. These sweat pants fit well and are comfortable. I use them both to workout and to lounge around. I bought a grey pair some years ago, they've been fine. Bought a black pair during a sale, same XL size that fit me great before. The new ones are completely different size, they seem to fit except for at the calves, they are EXTREMELY tight around the knee and calves and my calves are not even big at all. You'd expect the sizes to be consistent when buying the same product, might be saying something about the quality.